After staying awake into the early hours of the morning, it was finally time to call it a night. I climbed into bed, turned off the lights, and closed my eyes for some much needed rest... only there was a problem. I could hear a voice in my head repeating the same phrase over and over again. It started out indecipherable at first, but after continual repetition there was no mistaking it: SUPER HOT, SUPER HOT, SUPER HOT. If there's one thing that I feel safe to guarantee after my time with SUPERHOT, it’s that everyone who plays it will find themselves repeating that same phrase at one point or another. 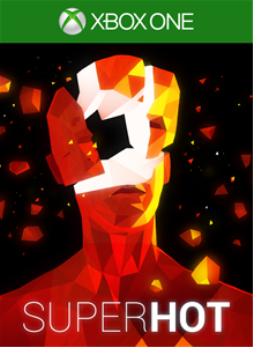 Similarly, I find it safe to say that I'll be thinking back fondly on SUPERHOT for some time to come. 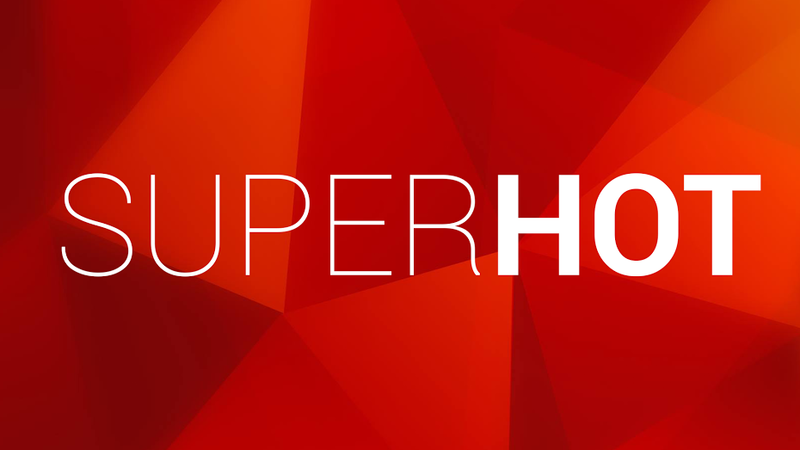 SUPERHOT is one of the most innovative shooters that I’ve played in years. I say that not only literally, but also to reference a part of the game’s narrative that I won’t spoil too much here. Presented as a new game on what appears to be an old DOS system, things start out simply enough with the goal of killing all of the red guys but soon delves into strange themes of freedom and control. The story eventually begins to intervene between levels more frequently and becomes an annoying break from the action. The game never felt as if it really required any sort of storytelling to help further it along and this seemed to be out of place instead, especially when considering just how fantastic the gameplay is on its own. 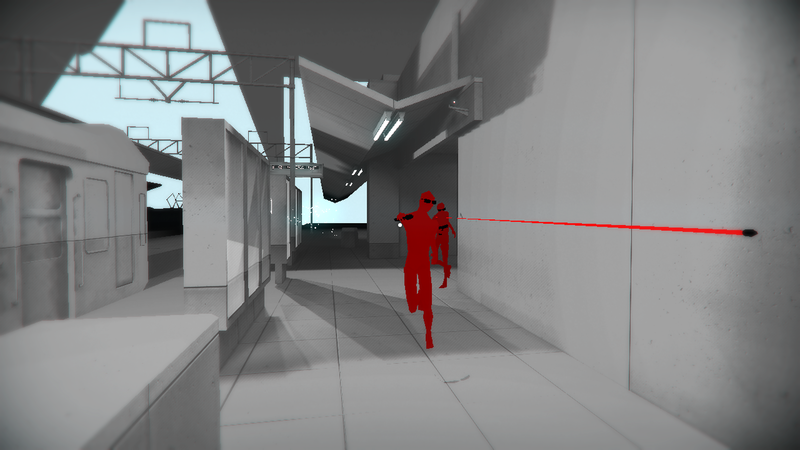 Movement in SUPERHOT is dictated entirely by the player’s motions. While stationary, every enemy, item, and projectile is nearly motionless and will remain that way until the player makes a move. With the speed of the action being directly tied to how fast you move, an entire layer of strategy is added to the mix. It might be tempting to just run towards an enemy with guns blazing, but there's far more of a necessity to dodge that bullet whose current trajectory is straight for you, because a single hit is all it takes to put you down. Whether armed with fists, melee weapons or guns, your enemies will continue to pursue you from all angles, making it all the more hectic when it's essentially one life to live. Fortunately, it's easy to keep track of everything that's going on. Each level's environment is soaked in shades of white and grey, while weapons and throwable objects are black, making them easy to spot. Meanwhile, your featureless, polygonal enemies are a sharp red that contrasts with the rest of the level. Everything has a minimalist look and feel, yet it's very pleasant nonetheless. There’s also nothing more satisfying than seeing enemies explode like shards of glass whenever you lay into them. One thing that gets lost behind the grand presence of controlling motion itself is that most objects can be manipulated far more than a lot of other games allow. Bullets can be sliced and shot out of the air. Objects can be heaved across the level to stun enemies and cause them to drop their weapons. 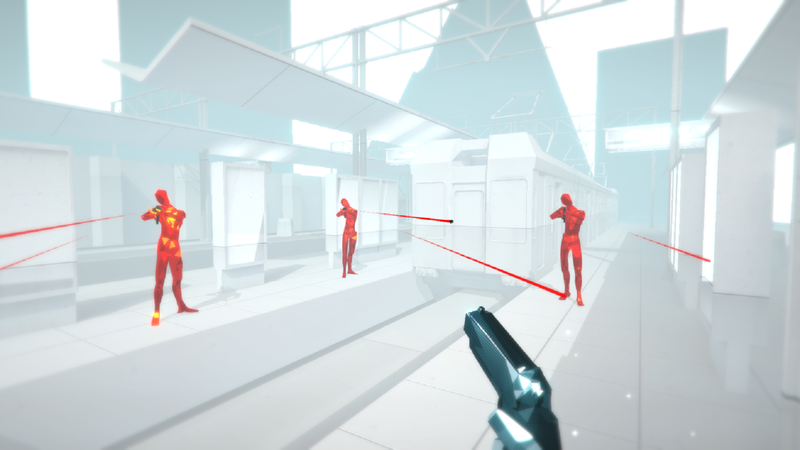 In many ways SUPERHOT feels like being dropped directly into The Matrix for obvious reasons, but also does enough to make itself fresh and unique. Unfortunately, there's no control option to bend at the hip to limbo under bullets like Neo, but moving in a zigzag pattern while watching the bullets whiz by is a pretty acceptable substitute. Thanks to the slower, more controlled combat, it's possible to pull off stunts that just cannot happen in most other shooters. In one scenario, I sliced an incoming bullet with a katana, then threw that katana like a spear into an enemy, hotswitched to another enemy in the distance (essentially taking control of their body), picked up and threw a fire extinguisher into the next enemy, and finished it off by stealing his pistol and shooting him in the head. Really, that’s just nothing; it’s just another sequence in a long line of possibilities that essentially defines what SUPERHOT is all about. Everyone reading this review right now could sit down and come up with a completely different means of getting through the level. It’s one thing to see the game through the slow, meticulous pace of the gameplay, and it’s quite another to see the highlights run in real time. Each level ends with a replay of the previous sequence and plays it at full speed to display what you just pulled off. This essentially helps to elevate the already present badass feelings to an even higher notch. The developers clearly knew that these replays would be a strong feature of the game, as there is a built-in GameDVR to easily save a recording of the whole replay or just sections of it. The external website Killstagram.com was even established as a place for players to share all of their proud moments. It's filled with all sorts of highlights and it could be interesting to see how it evolves forward in the future. 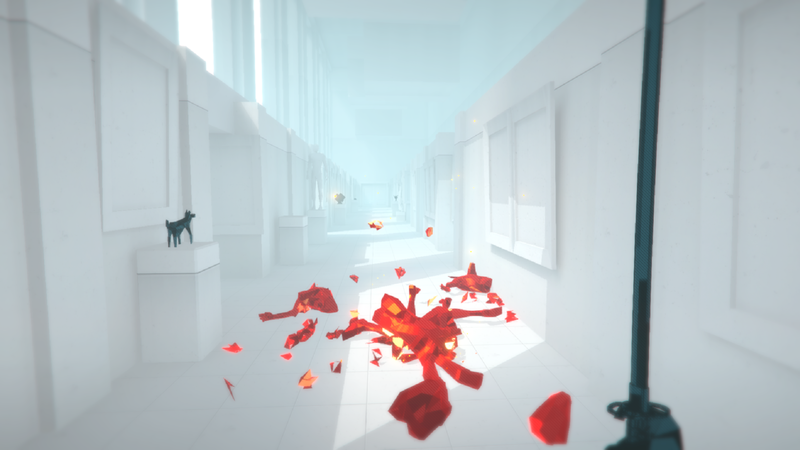 SUPERHOT's main levels are over fairly quickly and should only take most players around two hours to pass through. Fortunately, there's a lot of additional content with the Endless and Challenge modes that will keep players occupied for quite some time afterwards. Endless mode is exactly as it sounds; waves of red guys keep on coming until you are finally overwhelmed. Set across a handful of different levels, each has different variances that are unlocked after achieving a certain amount of cumulative kills. This includes objectives like getting as many kills as possible within a 20-second time period, or conversely, getting 20 kills as fast as possible. The game does seem to slow down performance-wise whenever progressing deep into one of the levels with a lot of kills. It wasn't anything that prevented a barrier from continuing onward, but it was definitely noticeable. The Challenge modes, meanwhile, are where most of your time spent in SUPERHOT will take place and are, perhaps, the best portions of the game as well. Taking the same identical levels as before, each of the challenges modifies a key aspect to create an entire new obstacle. While in one scenario you may only be able to fire once per weapon, in another there may be no weapons at all and you have to tackle it by using melee attacks only. Considering the need to change strategies with each new scenario, Challenge mode is essentially the means to test the player's mastery of the game. There's no denying that it begins to feel a bit repetitive over time, but the stark differences between the different challenge attributes are often enough to stave off those feelings. A majority of the game's achievements are not so much difficult to unlock as they are time consuming. Aside from your typical story progression and weapon kill achievements, some of the more lengthy ones include killing a whole bunch of red guys in Endless mode, finding all of the hidden terminals in each level, and completing every single challenge mode in general. My personal favorite, though, has to be for slicing a bullet in half with a katana, because that just never gets old. It should be noted though that one achievement is currently unobtainable, making it impossible to complete the game, at least for now. The SUPERHOT Team managed to take what seems like a fairly simple mechanic and turn it into a game that is full of possibilities. Having all movement synced to that of the player provided a fresh twist on the shooter genre, and real time replays give the player another chance to feel awesome about what they just pulled off. Despite the relatively short length of the main levels, the Challenge and Endless modes should provide most players with plenty to sink their time into. For several reasons, the game is one of the most innovative shooters in years and should provide players with many hours of entertainment. The reviewer spent 19 hours just shooting red guys. Only two of the achievements remained locked at the time of writing this review. A copy of the game was provided by the publisher for the purpose of this review.